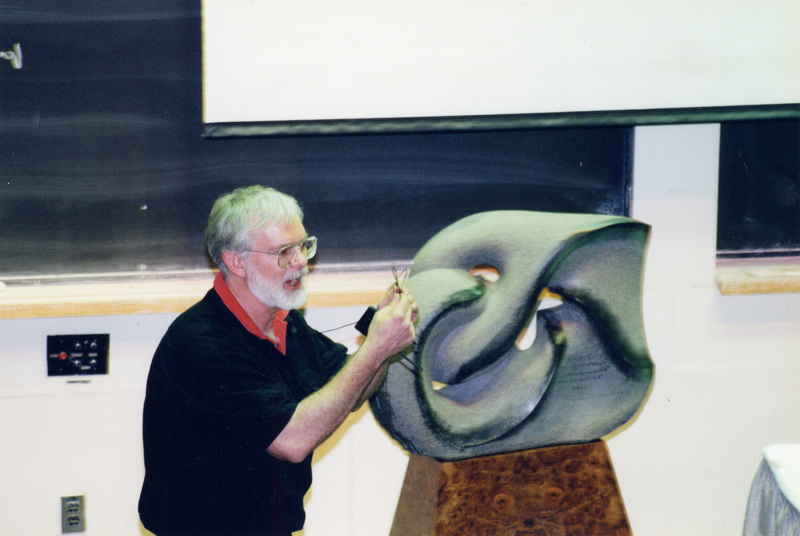 The original Clay Mathematics Institute icon took the form of the sculpture "Figureight Knot Complement vii/ CMI" by sculptor Helaman Ferguson. The CMI commissioned the sculpture in early 1999, and the sculptor himself unveiled the granite masterpiece on May 10, 1999. The figureight knot is presented as an esker curve winding with no self-intersections on a double torus. The complement of the figureight knot has the structure of a double quotient group, one of the groups being discrete. The mathematical object which the sculpture represents is the orbifold X given as a quotient of three-dimensional hyperbolic space by a discrete group action, as described by the equations in the image, which are inscribed on the larger granite sculpture. The current logo of the CMI echoes the esker curve. The first line says that the figure-eight knot complement (i.e. S3 \ 41) is a quotient of hyperbolic 3-space by a discrete group Γ of isometries. Viewing them as 2x2 matrices, an explicit generating set is given in the bottom line. where θ1, θ2 and θ3 are the dihedral angles of the tetrahedron and Λ is the "Lobachevsky function". In this case θ1 = θ2 = θ3 = π/3. The Lobachevsky function is defined as an infinite sum, but in this case, because we're dealing with θi = π/3, you get a periodicity and you get just the five terms v1 ,..., v5.